of warning bumps and came up on this quadruple set of stop signs. It made me laugh, but it also made me think. 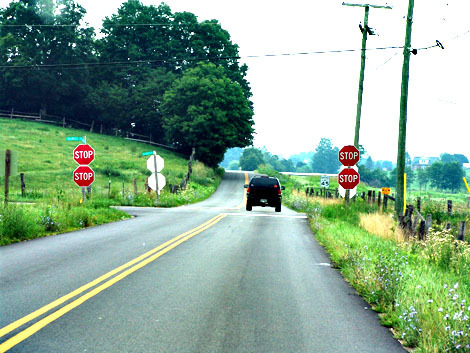 This crossroads is out in the country, but they must have had a good reason to erect four stop signs instead of one. Enough people must have been killed or injured at this intersection to warrant this quadruple warning. As I drove through the intersection and into the countryside beyond, I started thinking about my own situation. I was on my way to a convention for non-profit organizations and I was double-booked much of the day. I had even skipped breakfast so I could make the thirty-five mile trip in time for the opening speech. to become more successful in bringing their products to market. I have written warnings about seductive jobs here and here and yet I was repeating the old cycle again. The lure of being able to make a real difference had pulled me right in. but I was struggling to find time to write posts. with my life, given that there are only 24 hours in a day. that comes from a complete life as opposed to a busy one. tasks and get help on the tasks that can be delegated. me a line and tell me what it meant to you. Oh David, why, even at our age, do we forget these simple facts? I’m borrowing your stop signs for a day to think things over here up north. Thank you for sharing. Your experience provokes reflection. It seems we need to see stop signs on our way from time to time 🙂 The more the better. The double stop signs were erected after four fatal traffic accidents in 18 months at that intersection. The last killed a mother and two young children. Recently I’ve been going overcommitting and piling on my plate with stuff. I realize that I have this habit, and would find all sorts of excuses not to relax and chill out. I love those 4 stop signs – what an appropriate metaphor (including why they may have been posted there). Back in the late ’80s, there was a T.V. program called Thirtysomething. Its weekly dose of adult angst suited me well at the time. In one episode, the two friends around whose families the program revolved were working on an ad creative for an Italian sports car, the Spingere. The tag line they came up with was: Stop! Go! Spingere! (Spingere, by the way, just happens to be Italian for drive.) The image was a flashy, Ferrari-esque sports car braking to a full stop…then burning rubber as it accelerated off the mark. The catchy Stop! Go! tag and the image it evoked stuck with my wife and me for years. Come to a full stop. Pause. Reflect. Then go. One stop sign or four, you do have to go again. Just be sure that you will find satisfaction in your destination and balance in the route you take to get there. Boundless energy and personal confidence often lead to over commitment, I think. So reign it in, but keep in mind that people like you change the world.. This same situation happened to me years ago as I raised and homeschooled my three children while helping my husband run his business from home. I started to make notes of what was important to me, my family and the kids activities in order to gain control of my life. Those notes became my first book, that by the way I need to read again because I’m getting too busy again. I guess we are never done simplifying our life, we have to fine tune it as we go. Thanks for reminding us to think about the importance of a complete life.